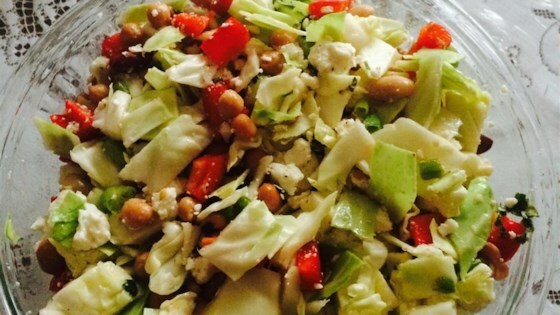 "A tasty, nutrient-packed salad that can be eaten by itself or as a side dish. Makes a great lunch the next day too! Add more lemon juice and olive oil if you like your salad to have a lot of dressing. Use garbanzo beans in place of kidney beans if you prefer." Rinse kidney beans under cold water. Drain well. In a large salad bowl, combine beans, red pepper, cabbage, onions, feta, parsley, garlic, lemon juice, and olive oil. Cover and refrigerate for up to 3 days. Who said healthy had to be boring!? I didn't change a thing - this is food at its best. I made the recipe as listed and it was tasty! Even my husband, who swears he hates Feta cheese dug in and had seconds. WOW!!! Fantastic! I added the dressing the night before and then added another dose of it before serving. I tell you what, this was easy and it was a huge hit at our bbq for the 4th.